These are important aspects of both high end freshwater plant keeping and symbiotic Zooanthellae living within Photosynthetic invertebrates. Photosynthesis is the synthesizing by organisms of organic chemical compounds, mainly carbohydrates, from carbon dioxide using energy obtained from light rather than the oxidation of chemical compounds. Put another way, this means photosynthetic plants, algae, and similar use of energy obtained from light to produce cellular chemical energy and carbohydrates when combined with carbon dioxide necessary for life processes including nitrogen processing for growth. In order for the photosynthetic process to take, the organelle of the cell where light the energy to chemical energy takes place (named the chloroplast), must receive sufficient PAR (photosynthetic active radiation). 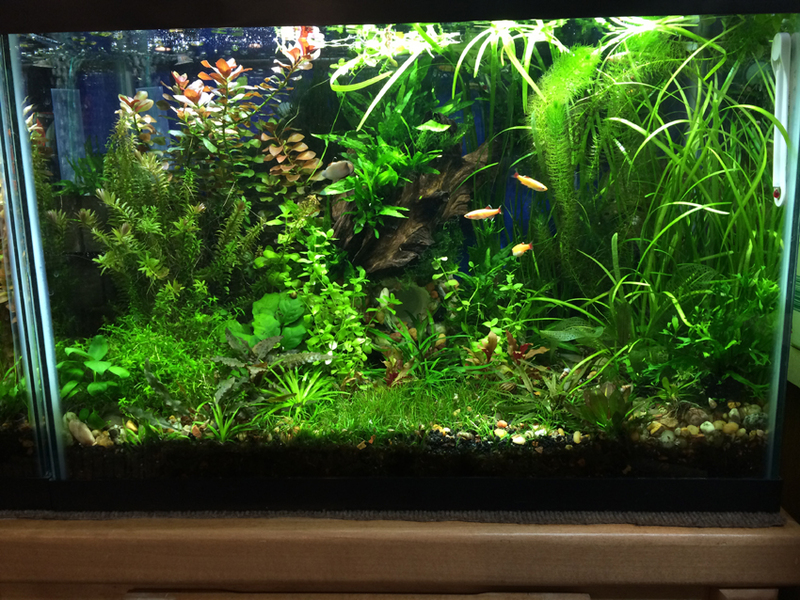 Often in aquarium environments the compensation/saturation point is not met within the chloroplast, this results in the organelle not producing the optimum amount of carbon bi-products (carbohydrates), and this excess energy will not be transferred to the host Photosynthetic Invertebrate.. The other side of the coin (more common in the ocean, tropical rivers, etc.) is photinhibition, which is the result of an excess of light energy causing cessation of photosynthesis altogether. Photosynthetic invertebrates as well as many higher plants have many light inhibiting pigments to protect themselves from tissue damage caused by photinhibition (hence the green and other colors that are often more vivid in higher light). A myth of reef aquarium keeping is that Photosynthetic invertebrates such as corals only need the “correct” light to survive, however this is incorrect as no known animal can survive solely on light energy as there must always be a source nitrogen and other minerals for growth and reproduction. PAR is the abbreviation for Photosynthetically Active Radiation which is the spectral range of solar light from 400 to 700 nanometers (some resources/research indicates up to 750n) that is needed by higher plants & symbiotic zooanthellic algae. This is found from actinic UVA to near infrared. UVA is the bandwidth found between 400-550nm which is the absorption bandwidth of chlorophylls a, c², and peridinin (the light-harvesting carotenoid, a pigment related to chlorophyll). For our discussion of PAR, near Infrared is defined as the bandwidth found between 620-750nm which is the red absorption bandwidth of chlorophylls a and c² (true infrared is beyond 750nm). 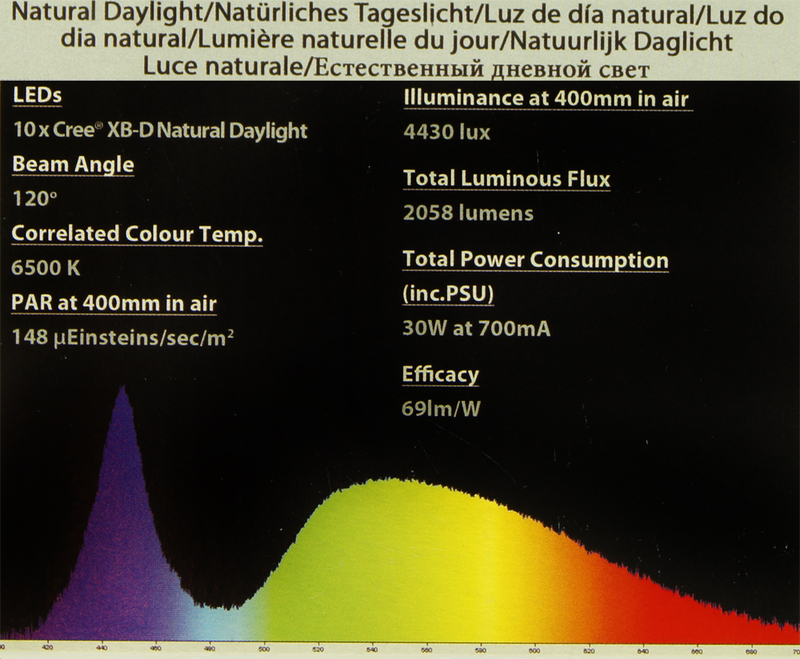 Light sources that emit mostly actinic light will often have a lower PAR (although actinic Violet-blue still occupies an spike in PAR as seen from the graph and improve the PAR of your lighting), bulbs that occupy mostly the middle spectrum (yellow-green) such as “warm White (2700K) will produce little necessary “Useful Energy” spikes (PUR) within PAR, while bulbs that produce UVA and yet more infrared will produce more important PAR light energy (as seen from the graph which shows the UVA spike and two infrared spike required for PAR). It is noteworthy that most symbiotic zooanthellic have evolved/adapted to the lower blues of the Ocean Reefs need more of the blue/actinic spike than “higher plants”, hence the popularity of actinic lights for reef aquariums (this is true of other green algae). 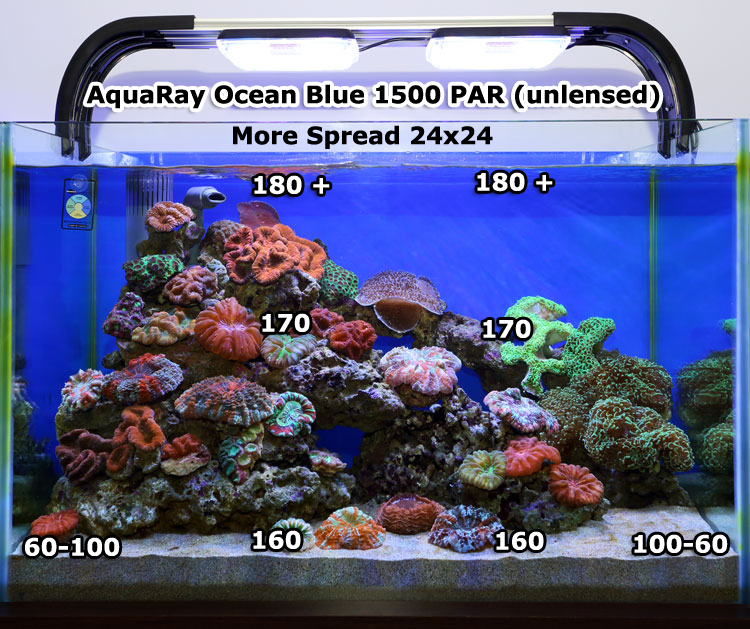 However the optimum nanometer range is about 465-485nm (with some corals requiring more 420 as well), not the ONLY the lower 420nm many actinic lights produce or the more broad range many “blue” aquarium lights produce of 400-520 nm. This is where the latest technology LED lights “shine”, having a more precise 465-485nm blue as well as the lower actinic blue found in the Fiji Blue LED. For this reason it is a good idea to have extra actinic for corals/clams that depend upon zooanthellic algae, while at the same time limiting blue/actinic in freshwater aquariums to avoid excessive green algae growth. With he above in mind, the addition of lights that product more near infrared light spikes or the use red LED emitters does not help most photosynthetic corals and in fact some studies indicate to much red light can hinder acropora growth. This of leaves me scratching my head why one oddly popular Aquarium Reef LED manufacturer adds red emitters to their LED fixtures (& worse, green emitters)? 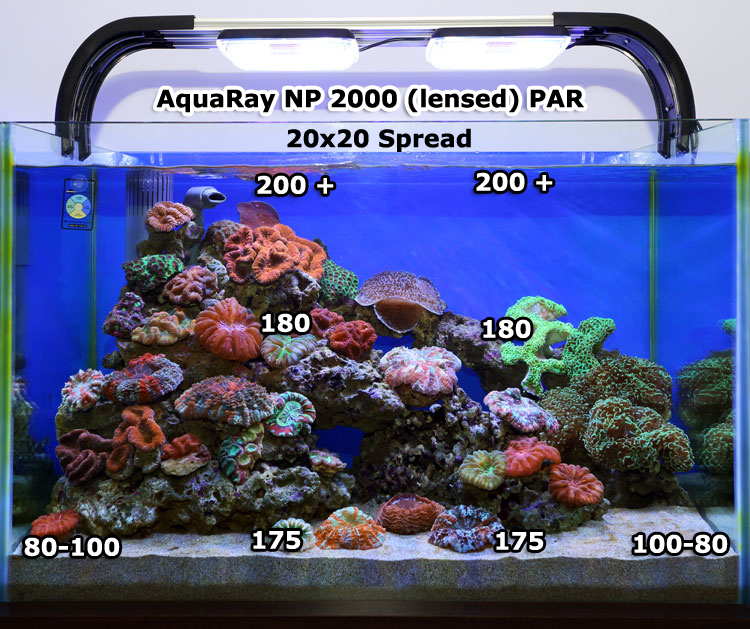 PAR is the simplest, albeit not the most accurate way to measure light energy and quantity for the home/office/commercial aquarium. PAR is more simple to define and measure than any other forms of light measurement. 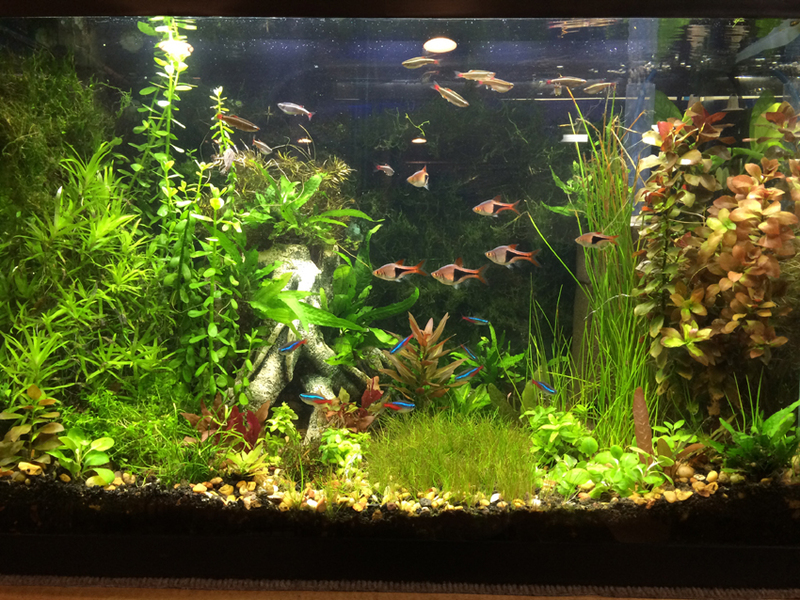 However it is noteworthy that PUR is the much more important measure for saltwater reef aquariums. The facts are you can have a light with a higher PAR be a considerably lesser PUR and thus inferior light. For the aquarium keepers purpose, PAR is the number of photons per meter squared per second of light that falls between 400 nm and 700 nm in wavelength with the better PAR meters measuring the important spikes. To bring this concept of PAR vs. PUR to live for a real world example is a high end LED fixture compared to low grade (low PUR) fixture. Two fixtures could have the same PAR, but one could have a higher PUR. Like I’ve said in other lighting articles before…Just like there are multiple ways to add up to 10 (5+5 or 2+8), both will give you the same appearance, but one might be more beneficial to the overall tanks needs. I strongly recommend taking a look at this additional article to help understand this concept more. It’s a shorter read, but if you digest the information in the post, it will help make this a concert idea. 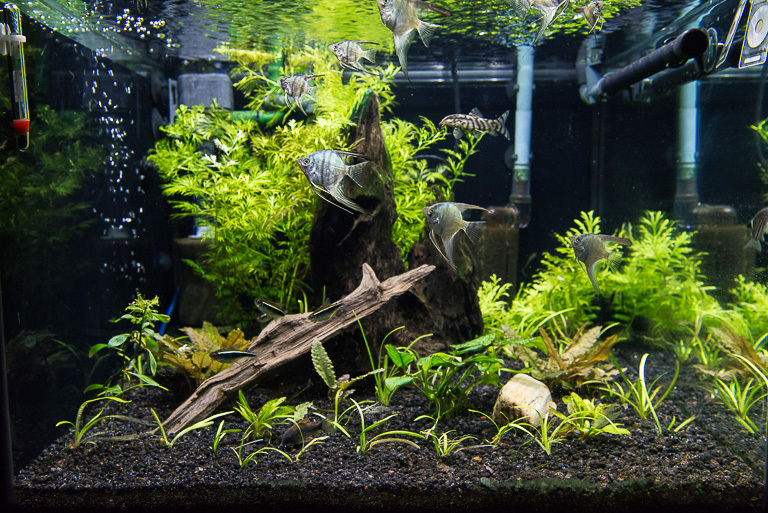 This professional was not taking into account PUR, but was proving that most of what we can put to our aquariums can be grown with a lower PAR. Having a high PUR fixture will only enhance the growth of the coral or plants. 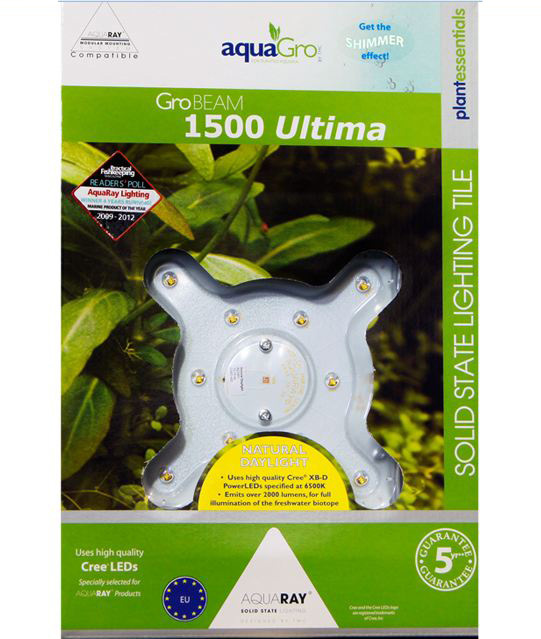 A cheaper LED could have a higher PAR, but not allow for corals or plants to thrive as much as a higher PUR fixture. In this case, more PAR is required to make up the lack of PUR. Remember: PAR varies fixture to fixture and all depends on the tech. used, mounting height, and spread. A PAR meter can be used, but it is just a tool and does not show the whole picture. It leaves out the important concept of PUR.